MIAMI - The lengthy press releases published by Panama law firm Mossack and Fonseca at the centre of the massive Panama Papers data leak, claiming that its customer identification procedure and compliance staff were conducting due diligence on all their clients, now appear to be a joke. Miami is buzzing about the disclosure that Venezuelan agent Franklin Duran was conducting business with Mossack and Fonseca while he was actually serving a four-year sentence in US federal prison. This confirms that there were no checks performed on clients by the law firm. Duran is notorious in Miami as a result of the "Suitcasegate" corruption scandal, which was the seizure of $790,550 in cash by Argentinean customs when local Key Biscayne resident, Guide Antonini Wilson, attempted to smuggle in an illegal campaign contribution destined for former president Cristina Fernandez de Kirchner. The money, which came directly from Venezuela state oil company PDVSA coffers, traveled with Antonini to Buenos Aires on a private jet charter, where the passengers on board, which included a number of PDVSA and Venezuelan state officials, imbibed an obscene number of bottles of Johnnie Walker Blue Label $200 scotch. It was later alleged that $4.2 million was successfully smuggled into Argentina that day for Kirchner's campaign by another individual on the flight. Only the best for bulk cash smugglers. Duran later traveled to Miami and threatened Antonini and his family, if he told the authorities the truth about the origin and purpose of the money. 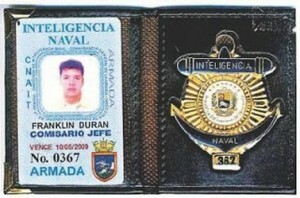 Duran was convicted of the federal crime of acting as an unregistered agent of a foreign power, namely the government of Venezuela, and conspiracy. The fact that a 15-second Internet search would have turned up Duran's case confirmed that there was, in essence, no real compliance practiced at Mossack and Fonseca. The firm admits that it did not discover Duran's unsuitability as a client for five years after the fact, and that may have occurred only because investigative reporters were inquiring about Mossack and Fonseca’s clients in 2015, and the firm may also have known about an American law enforcement investigation that began in 2014. Duran, after serving his sentence, was deported from the United States. He is reportedly living in Panama. Next month, a complete list of Mossack and Fonseca clients is due to be released, and further evidence is expected, confirming that the law firm deliberately ignored performing even the most rudimentary check on new clients, so long as they paid the exorbitant fees charged for corporate services. Kenneth Rijock is a banking lawyer turned-career money launderer (10 years), turned-compliance officer specialising in enhanced due diligence, and a financial crime consultant who publishes a Financial Crime Blog. The Laundry Man, his autobiography, was published in the UK on 5 July 2012.